Following two days off from racing at the America’s Cup World Series – Cascais, the competition will resume on Wednesday with qualifying for the Cascais AC Match Race Championship. Over the next three days, all nine teams will participate in a mix of fleet and match racing to secure spots in Saturday’s Match Racing Championship. Many of the teams elected to rest their sailors for at least one day to start the week, after the physical efforts the crews expended over the opening weekend. Team Korea, who didn’t sail on Monday, was on the water Tuesday, after holding a traditional Korean ceremony to bless their boat in the morning. Skipper Chris Draper agreed with Hutchinson’s assessment about the value of giving his crew time to recover and process lessons learned over the first days of racing. All the teams spent Tuesday morning at the beach, but it wasn’t for rest or relaxation. In total, more than a hundred volunteers reported for duty for an hour’s worth of coastal conservation work on the cliff-tops overlooking the shimmering Atlantic Ocean. It was the first step of many in the new America’s Cup Sustainability Series, which is focused on exposing global audiences to the issues facing our worlds' oceans. Skippers from all the teams were issued with a pair of gloves and went off to remove as many sour figs as possible from Boca do Inferno. The sour fig is an invasive species that prevents other plants from taking root. This was followed by the first America’s Cup Sustainability Series Forum, where Dan Pingaro, CEO of Sailors for the Sea, welcomed the America’s Cup’s ongoing commitment to operating a Clean Regattas policy at all of its events, starting with this first America’s Cup World Series event. 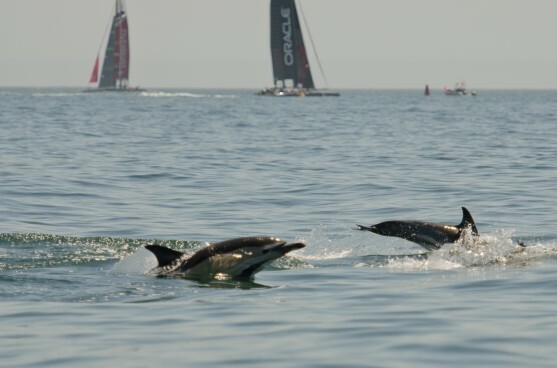 Craig Thompson and Tom Huston, respectively the CEO and COO of America’s Cup Event Authority, said the huge media interest around the America’s Cup could be harnessed to bring a strong environmental message to a large global audience. “We want to use the America’s Cup to help people understand the problems with the world’s oceans, and we want to challenge other sports to take some positive action,” Thompson said. After the coastal conservation effort, most teams were on the water for an afternoon of training in light winds ahead of Wednesday’s racing which may feature the most challenging conditions the crews will face in Cascais, with the wind expected to be variable in both speed and direction for most of the afternoon. Racing is scheduled to start at 14:10, with live video streaming coverage available through www.americascup.com.